Freshman RJ Meyer uses colors and locations to express emotion in his portraits. Junior Alice Yuan dreams of a career in social media marketing. Her Instagram, @aliceleighyuan, employs bold colors to capture her personality. Sophomore Jake Bridgman dresses like the director he hopes to be. There once was a time when our artwork was autographed with messy handprints slapped on with paint. These days, it’s not actually so different; in the age of social media and constant content creation, personal branding is imperative to artists at Emerson. Instagram users are familiar with the concept of themes, or similarities between posts creating a coherent mosaic of pictures. Young professionals draw from their idols to assemble a unique wardrobe—the ultimate illustration of one’s identity. Fashionistas and photographers collect colors and styles that draw their attention, looking to curate a solid recognizable aesthetic that appeals to their audience. Alice Yuan, a junior communications studies major with public relations and social media experience, said she thinks the image people sculpt for themselves is an artform of its own, especially at Emerson. Yuan said she sees personal style as a way to express who she is or who she wants to be. Although she mostly wears black, she said she posts photos with bold colors and fashion on social media to reflect herself more accurately. With a declared minor in marketing and over 3,000 followers on Instagram, Yuan dreams of working in public relations and online blogging. She said she’s fascinated with the image people and companies put out to the world. Yuan said some celebrities, like the Kardashian family, are so popular on social media that their name becomes their brand. However, for artists just starting out, she said an identifiable aesthetic is necessary to gain recognition. Jake Bridgman, a sophomore visual and media arts major and aspiring director, said that it is important to dress for the career you want. Bridgman said he wants his clothing to communicate confidence and commitment to his desired profession. “If you want to dress for the job, directors are like 70 percent of the creative power in a film and if you can’t be creative with the way you dress, I feel like there’s some dissonance there,” Bridgman said. Bridgman singled out Christopher Nolan and Denis Villeneuve as two directors he admires for their work and their personal aesthetics. But Bridgman said that many outside the film industry have also made their mark in creative ways. RJ Meyers, a freshman visual and media arts major and self-taught photographer, said his aesthetic is still evolving. Currently, he’s interested in portraits with high contrast and stories to tell. Meyers said he uses color palettes and backdrops to tell the subject’s story. 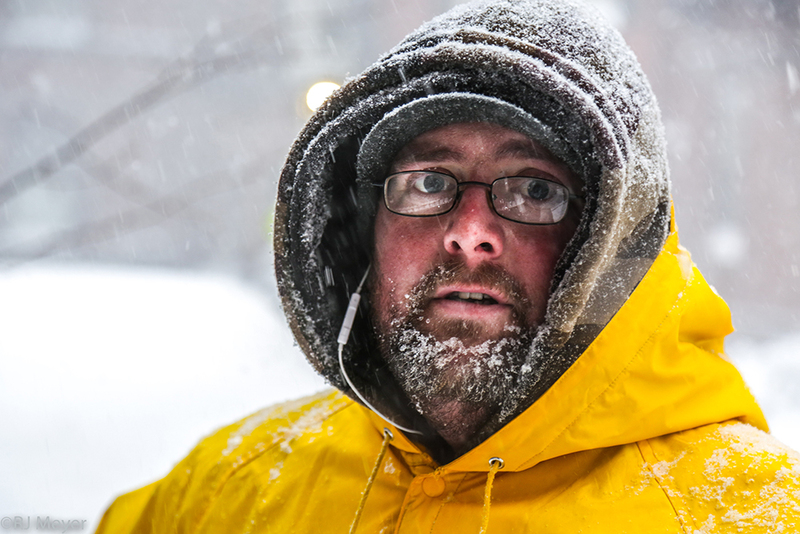 One example is a photo he took of a man shoveling in Beacon Hill. Meyers said he used the man’s bright yellow jacket to contrast against a monochromatic frame. Emma Fishman, a senior visual and media arts major and president of Emerson’s Fashion Society, said clothing aesthetics change with the personality of the wearer on any given day. She said hers have drastically varied throughout the years. The Fashion Society’s newest lookbook, called Index Vol. 2, will be released at the end of the semester. Fishman said she thinks they’ll do a studio shoot with accent colors and clothing the models thrifted themselves. One style they’re looking to play with involves blush tones against rocks outdoors. Bridgman, who dresses as the director he wants to be seen as, said he can learn a lot about the mind of a person from their self presentation. “There’s a reason why people choose the clothes that they do and that can communicate a lot about your profession, your ideas, and the way you see yourself and the world,” Bridgman said.